The Carmen is an arrangement that exudes beauty and grace. 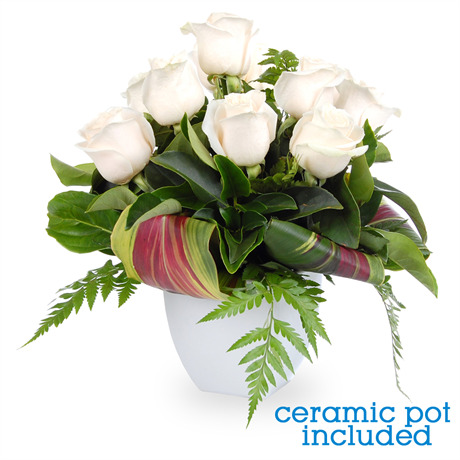 Elegantly presented in a ceramic pot, these ten creamy white roses accentuated with fern and cordyline are picked field fresh. Each pure white rose is inspected for perfection, down to the very last petal. White roses traditionally symbolise grace, purity, and hope. This stunning arrangement would be ideal as a sincere sympathy gift, a beautiful table centrepiece, or as a ‘I’m thinking of you’ gift.